Litecoin, one of the cryptos getting into the limelight fell for around 13% last week and was valued at $84.39 post the drop. This was the largest dip ever seen by the altcoin in the last 7 months. Its market capitalisation is the lowest it has ever been since December 2017. The highest that it ever traded over the last year was around $340, when the price boomed from a little less than $100 last December. The reports during that time said that even criminals had transferred their interest from Bitcoin to Litecoin. 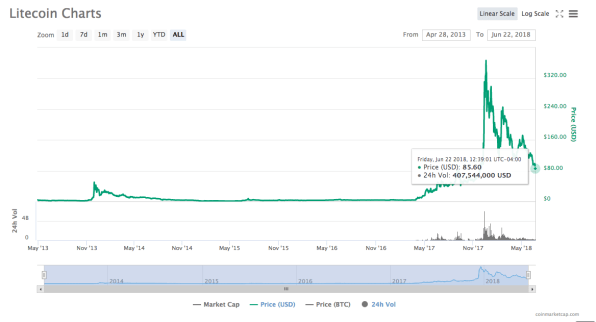 Since that spike, the cryptocurrency’s value has fallen continuously over time. Not just Litecoin, but even the major coins like, Bitcoin and Ethereum have seen a downfall over this past week. Reports say that this decline in the values of cryptos is because of the risk-averse cryptocurrency market.